Elmira City Hall is located at 317 East Church Street, Elmira NY 14901; phone: 607-737-5673. Photo: John Brand Sr. House, ca. 1870, 405 Maple Avenue, Elmira, NY. Listed on the National Register of Historic Places in 2010. Photographed by user:DMadeo (own work), 2013, [cc-by-3.0 (creativecommons.org/licenses/by/3.0)], via Wikimedia Commons, accessed July, 2013. Elmira originated around 1790 when the first pioneers settled on the north bank of the Chemung River. The first name for the hamlet was Newtown, which was changed to Elmira in 1828. The commercial importance of the village began in the 1830's when New York State was experiencing a rage for canal-building. In 1833, the Chemung Canal was completed from Elmira to Watkins Glen at the south end of Seneca Lake. The Canal provided a link with the Erie Canal (via Seneca Lake) the Hudson River, and New York City. At the same time a feeder canal was constructed between Corning and Elmira, and connections were made to the North Branch Canal at Athens, Pennsylvania. The same year the canal was finished, the Chemung Canal Bank was chartered in Elmira. This building would continue in use as a bank until 1920. In 1836 Chemung County was organized with Elmira the county seat. The first county buildings were constructed along Lake Street where the present county buildings are located. Among the original structures, the former clerk's office still survives. This area became the preferred area for the leading citizens to build their homes. 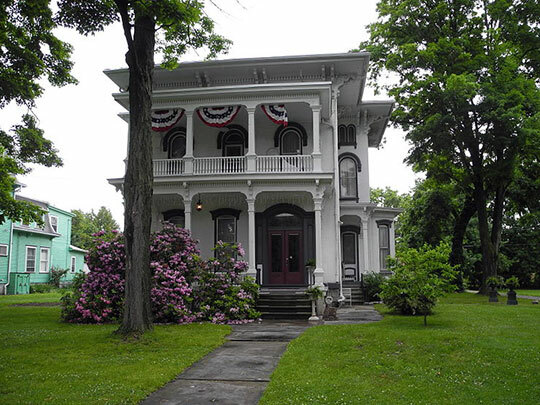 John Arnot, Sr., an important developer and first president of the Chemung Canal Bank, constructed his Greek Revival mansion opposite the county clerk's office. By 1849, the New York and Erie Railroad was completed to Elmira. Two years later the line extended to Buffalo. During the next twenty years main lines of the Lehigh Valley and the Delaware and Western railroads were constructed through Elmira and the city became an important transportation center. Elmira's most significant growth began during the Civil War when it was a major troop staging area with a large prison camp. In 1864 the village was incorporated as a city. Two years previously, a new county courthouse had been erected. This building is one of the most important designs of Syracuse, New York architect Horatio Nelson White. Breyer, Lucy and Reed, Roger Gates, Elmira Civic Historic District, nomination document, 1979, National Park Service, National Register of Historic Places, Washington, D.C.